You're going to love camping in this Vibe travel trailer that can sleep six. The dual opposing slides open up the whole rear living area for a more at-home feel. Meal prep is made easy with a kitchen island in this unit, plus there is a kitchen skylight, a pantry, and a three burner cooktop to make meals just like you do at home. 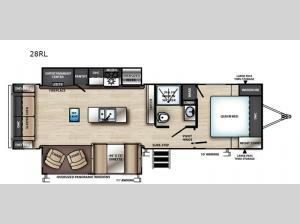 This travel trailer includes a sleeper sofa for extra guests, lounge chairs, and a dinette to enjoy game night at. The front private bedroom features a queen bed, a nightstand, and two wardrobes, so you don't have to leave anything behind. This model has a touch of luxury with a pivot hinge door to the bedroom, a fireplace, and a large shower with a skylight above, and don't forget the oversized panoramic windows in the slide out, giving you a full view of the outdoors!